Alan Robock with an image of The Scream. In the study, published this week in the Bulletin of the American Meteorological Society, Robock and an international team of scientists worked to identify what natural phenomenon might have inspired the Norwegian expressionist to paint the spectacular background sky in the iconic 20th century painting. They propose that the artist’s depiction of a colorful wavy sky could have been influenced, at least in part, by nacreous or “mother of pearl” clouds. This rare clouds occur in high latitudes in the stratosphere, the second layer of the atmosphere above us. They’re made out of ice or nitric acid and are illuminated by dawn or sunset when they’re laced with iridescent light from below the horizon. The result is a pastel colored sky, though not to be confused with the similarly surreal-looking night-shining clouds. Many art historians suggest “The Scream” is the product of a unique mind under psychological distress, as evidenced by the fact that Munch painted four versions of the same scene. The evocative portrayal of a screaming figure on a boardwalk has captured the fascination of many, and the second version of “The Scream” is the most expensive painting sold at auction at 120 million dollars. But Robock and other scientists have been puzzled by the underlying scientific question of what’s in the sky so they set about trying to match the spectacular background sky in the iconic 20th century painting with an actual meteorological phenomenon the artist witnessed. The researchers studied the colors in different iterations of the painting and compared them to the colors in the sky when mother of pearl clouds were present and during volcanic sunsets following an eruption. They analyzed their color content and cloud patterns, finding that the sunset colors accompanying nacreous clouds were the best match. The explanation of nacreous clouds are consistent with where and when Munch painted iterations of his iconic work of art, in southern Norway in the late 19th century and early 20th century. 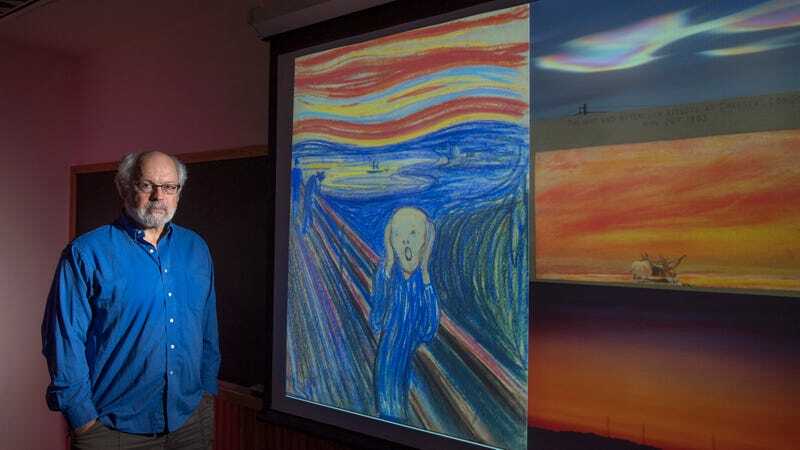 According to researchers, if it were indeed the case, “The Scream” may be one of the first known artistic representations of nacreous clouds. There are some aspects of nacreous clouds that are not depicted in the painting, though. For instance, the cloud’s characteristic iridescence is missing. One possible explanation is that Munch did not have the proper pigments to replicate what he actually saw. There are other possible meteorological theories behind the painting as well. Robock and other experts have suggested Munch painted the sky from memory based on what he saw after the 1883 eruption of Krakatoa, which occurred 10 years before he first painted “The Scream.” That eruption shot tiny particles called aerosols into the atmosphere and caused similarly vivid sunsets. According to Robock, we cannot rule out the possibility that the sky in the painting is inspired by nacreous clouds or volcanic sunsets, or that it’s a confluence of the two.